Vyse is the main character of Skies of Arcadia. He is adventurous and loyal to his friends. When faced with a challenge, he never backs down. His best friend is Aika. What people think of him depends on the decisions that you choose. His choice of Weapons is the Cutlass. 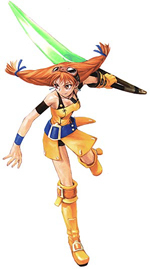 Aika is Vyse's best friend with the pointy, orange hair. Like Vyse, she is adventurous, but at times, she is more concerned with finding treasures rather than just discovering. She too cares about her friends. Her choice of Weapons is the Boomerang. Fina is a mysterious girl from a lost civilization on a quest that can spell the salvation or destruction of Arcadia. She is naive when it comes to the world, but Vyse and Aika help her get used to it. She is kind and somewhat shy, but she will fight if it means that Arcadia will be saved. She is by far the best Magic user, and her choice of Weapons is Cupil. Drachma is a grumpy old man hunting the great Arcwhale Rhaknam. He is often called "Captain Ahab" by SoA fans, and for good reason. He chases after Rhaknam for something that happened in his past. I'm not going to say what because it is probably the most touching scene in SoA. His choice of Weapons is Mechanical Arms. Gilder is a womanizer through and through. He pilots the Claudia. With his crew, he searches all around Arcadia for what he deems the good life, but at the same time he is running from Clara. He has a pet parrot, and his choice of Weapons is Pistols. Enrique is the Prince of Valua. He abhors the way his mother Teodora is trying to conquer Arcadia. He feels that people should be governed with a kind hand rather than an iron fist, and that is why he gives the Delphinus over to Vyse and company. While in Yafutoma, he falls in love with Princess Moegi. He is basically a weaker version of Vyse. His choice of Weapons is the Rapier. Centime is a kind engineer/Blue Rogue that adopts orphans. He is the captain of the Ironclad and lives in Horteka. He too must be rescued from Moon Stone Mountain. Clara is the captain of the Primrose and a woman in love. She constantly chases the love of her life, Gilder despite him wanting nothing to do with her. She too is a Blue Rogue. Daigo is the exile Prince of Yafutoma and the leader of the Tenkou. He, like Vyse, thirsts for adventure and discovery. He seeks to regain the favor of his father and his kingdom. Don is a sailor in Esperanza that has lost all hope in the world and sailing. He spends his time drinking Loqua and wallowing in self pity. He lost his hope because, like all Esparanzans, he is trapped between the Dark Rift and an impassable land mass. Talking to Don gives Vyse a greater desire to pass through the Dark Rift even more than he already had. He can join your crew after you return from Yafutoma. Dyne is the captain of the Albatross and Vyse's father, but he only lets his son call him "Captain." He may seem harsh with Vyse, but he does love and respect Vyse deeply. Isapa is the High Priest of Ixa'taka. He is a womanizer, but he is the only one who knows where Rixis can be found. You must rescue him from Moon Stone Mountain. Jao and Mao may not seem good at first, but they are. They are part of the criminal group called the Tenkou. They are on a quest to capture 1000 swords. The King of Horteka had to flee from Horteka after the Valuans came to Ixa'taka. He hides out in the King's Hideout North of Horteka. He sends you on a mission to rescue Isapa. Lord Mikado is the King of Yafutoma and the father of Moegi. He grants you transportation to Mount Kazai. Later on, he is tricked by his advisor and the Valuans. Marco is a snot nosed kid that you meet in Valua. He shows you the way into the Arena from Lower Valua and is constantly being lectured by Vyse on why not to give up. He later sneaks aboard the Delphinus. Moegi is the princess of Yafutoma. She aids the Vyse and company by taking them to Exile Island after the Valuans take over. She falls in love with Enrique and joins your crew once you defeat Bluheim. Osman is the Merchant in Nasrad that Aika and Fina turn to to get Gold to buy a ship. She refuses, of course. She can later join your crew. Pinta plays no role in the story, but talking to him does allow you to download the Pinta's Quest game to your VMU. He too can join your crew. Polly runs the bar on Sailors' Island. Early on in the game, she is the one that tells Vyse and Aika about the Harpoon Cannon. She can join your crew later on in the game. Alfonso is a little pretty boy that rose through the ranks of the Valuan Armada because he came from a wealthy family. He is a coward and sends his pets out to kill the heroes rather than bloodying his own hands. Baltor is a Black Pirate there just for comedic relief. He hates Vyse with a vengance. He plays almost no role in the story except to teach you how to battle in Ship Battles. He also shows up with everyone else at the end. Belleza is the Valuan Admiral that specializes in espionage. You encounter her a couple of times in Skies of Arcadia. She deeply loves Galcian. De Loco is the Valuan Admiral that specializes in inventions. He is a little, okay very, crazy. You encounter him a few times, but he never poses much of a threat. Galcian is head of the Valuan Armada and answers to no one save Teodora herself. He is a powerful man obsessed with power, and he will stop at nothing to get what he wants. He is the mentor of Ramirez. Gordo is a Black Pirate. A Black Pirate Food Connoisseur to be exact. After being defeated by Vyse, he gives up pirating and opens up Gordo's Bistro in North Ocean. He too shows up with everyone else at the end. Gregorio is the Valuan Admiral that specializes in bunker defense. He is an honorable man that does not like Teodora's or Galcian's plans, but he will still follow his orders. He realizes that Vyse and his party are correct in their quest, so this tears him up inside. He eventually must make a choice between his loyalties to his nation or what he believes is right. He is the most honorable of all the Valuan Admirals. Kangan is the advisor to Lord Mikado. Muraji is his son. With the Valuans, they execute a plot to take the Yafutoman throne. Ramirez is a mysterious figure. He was Galcian's Vice-Captain until he was promoted. He loves Galcian deeply, but in a father-son way. He shares Galcian's vision for Arcadia and believes that Galcian is the only one fit to rule it. Ramirez has a mysterious past connected to Fina's. Teodora is the Queen of Valua. Her sole desire is to conquer all of Arcadia in the name of Valua. Even if it means unleashing the Gigas, she will have her wish to rule. Vigoro is the Valuan Admiral that specializes in pure attack power. He, like Gilder and Isapa, is a womanizer, and like Isapa, he has an eye for Aika. He relies too much on weapons, so if he is caught without his cannon, he is helpless. He is a little full of himself when it comes to women.